Last year someone stole a friend's wallet, then used the friend's ATM card to steal a large amount of cash. How did the thief know my friend's PIN? Simple. To help her remember her PIN, my friend used an easy-to-remember four-digit number--the year of her birth--and of course that information was on her driver's license in the very same wallet. An “easy” PIN or password is just too easy for a thief to guess. 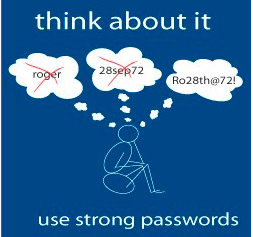 A strong password should be long and complicated - with numbers, punctuation, and both upper- and lower-case letters. It should be impossible to guess. Never use the same password for more than one website, service, or program. Luckily, you don't have to create all your passwords or remember all of them! Software can do it for you. A password manager keeps your passwords in an encrypted database. If you want to log into Ashby Village or Facebook or your bank, your password manager provides the password. It even stores your passwords in the “cloud,” so you have the same passwords available on your computer, tablet, and smartphone. When you use a password manager, you only need to remember one password - the master password that opens the password manager. And yes, that one password should be long, strong, complicated, and impossible to guess. You really don't want someone to hack thispassword! If you're worried about losing the password, share it with someone you trust. I have my wife's master password in my password manager, and she has my master password in her password manager. So which password manager should you use? I recommend LastPass because it is easy to use. The free version should be enough for most people. But for $24 a year, LastPass gives you other features – for example, it lets you share passwords and manage Wi-Fi logins. There are other password managers. I use KeePass, and a colleague uses 1Password. You may want to choose a password manger that your friends or family members use, so you can easily ask for help. Security breaches are the new norm, and it’s wise to take extra precautions to safeguard your personal information. Ashby Village Technology volunteers are available to help you choose passwords and set up a password manager. To request assistance, contact the office at volunteer@ashbyvillage.org or (510) 204-9200. If you have questions for me, email me at lincoln@lincolnspector.com.